Cyndi’s home, a ranch-style house built in 1958, is a stunning ode to all things found, reclaimed, and vintage. It’s a home you can stare at for hours: peering into glass-fronted cases, admiring collections of ceramics, and wondering at the story behind each object. It’s about as far away from childproofed as you can get. Nevertheless, it’s home to two girls both under the age of eight. 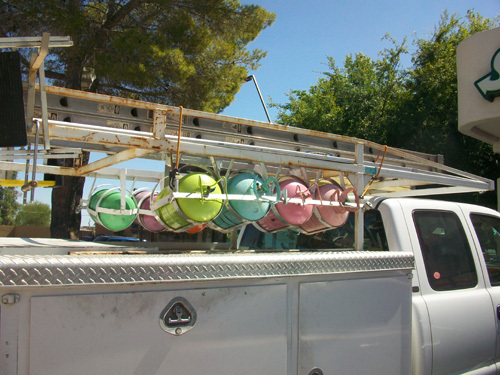 I made a stop at a gas station the other day and spotted this truck with gas cans on it. I was really in awe that they were so colorful and pretty. They looked like carnival cotton candy. I think this might become a drawing soon. Stay tuned . . . I headed down to Mexico over the weekend and I could not resist taking some snaps of the fun items for sale in the marketplace. I went with Rosie (my mom) and Pam (my sister) – we had a great time, ate well and laughed a little too much. Gal time is fun! We also had a chance to stop off in Yuma to eat at my favorite restaurant La Casa Gutierrez. La Casa Gutierrez - mmmmmm . . . . I created a paneled mural of words and images for the Phoenix Office of Arts and Cultures’ artSpace program. This mural was requested to provide a small bite of the activities that the POAC artSpace program offers. It will live at the Arizona Department of Education office as they are the funders of the artSpace program. POAC artSpace provides kids access to the Arts in an after-school setting. I worked with a gardening and growing theme using trees, flowers, butterflies, a wheelbarrow and seed packets. The lines of the tree trunk and branches as well as the flower stems are made by using words from poetry written by students participating in the artSpace programs. The leaves and butterflies are created out of photos of kids in the program and images of their artwork. Close-up of tree "photo leaves"